Patellar tendonitis (tendinopathy) is common among jumping athletes requiring repetitive jumping, landing, and squatting movements. This overuse injury was thought to have a inflammatory component (ex. tendonitis) but more current research supports the term tendinopathy. This term indicates a disruption in tendon fiber characteristics and alignment leading to a loss of its' tensile strength. Resting an injured tendon often leads to further disorganization of the tendon and pain. Conversely, individualized, progressive loading of the tendon (exercise) provides the tissue a stimulus to repair itself along the lines of stress. This remodeling process can take up to 1 year to complete although patients often feel better and return to sport in 8-12 weeks. New research has highlighted the effectiveness of specific exercise programs to both immediately reduce patellar tendon pain and facilitate a return to prior levels of activity. Rio and colleagues initially demonstrated the effectiveness of isometric (no change in muscle length) contractions on a slant board in patients with patellar pain (Br J Sp Med 2015, Clin J Sport Med 2017). Patients who performed these exercise holds (5 reps x 45 seconds) saw an average 7 point reduction in pain on a scale of 10. In both studies, Rio showed this exercise was more effective than isotonic exercise for pain reduction. van Ark and colleagues continued this line of research among in season athletes with patellar tendon pain (J Sci Med Sport 2016). They randomized 29 patients to either a 4 day a week isotonic or isometric training program over the course of 4 weeks. Interestingly, the authors made no adjustments to these in season athletes training programs. The authors found both groups reduced their pain, but no differences were found between groups. 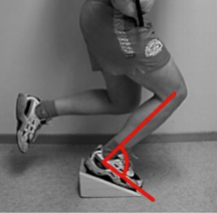 This study highlights the importance of isometrics if an athlete is unable to tolerate a complete repetition on their injured tendon. In our Boulder Physical Therapy practice we often start with isometric contractions before progressing to exercises through the available range of motion (isotonic) as the patient's symptoms improve.